Introduction Evening-time exercise is a frequent cause of severe hypoglycemia in type 1 diabetes, fear of which deters participation in regular exercise. Recommendations for normalizing glycemia around exercise consist of prandial adjustments to bolus insulin therapy and food composition, but this carries only short-lasting protection from hypoglycemia. Therefore, this study aimed to examine the impact of a combined basal-bolus insulin dose reduction and carbohydrate feeding strategy on glycemia and metabolic parameters following evening exercise in type 1 diabetes. Methods Ten male participants (glycated hemoglobin: 52.4±2.2 mmol/mol), treated with multiple daily injections, completed two randomized study-days, whereby administration of total daily basal insulin dose was unchanged (100%), or reduced by 20% (80%). Participants attended the laboratory at ∼08:00 h for a fasted blood sample, before returning in the evening. On arrival (∼17:00 h), participants consumed a carbohydrate meal and administered a 75% reduced rapid-acting insulin dose and 60 min later performed 45 min of treadmill running. At 60 min postexercise, participants consumed a low glycemic index (LGI) meal and administered a 50% reduced rapid-acting insulin dose, before returning home. At ∼23:00 h, participants consumed a LGI bedtime snack and returned to the laboratory the following morning (∼08:00 h) for a fasted blood sample. Venous blood samples were analyzed for glucose, glucoregulatory hormones, non-esterified fatty acids, β-hydroxybutyrate, interleukin 6, and tumor necrosis factor α. Interstitial glucose was monitored for 24 h pre-exercise and postexercise. Results Glycemia was similar until 6 h postexercise, with no hypoglycemic episodes. Beyond 6 h glucose levels fell during 100%, and nine participants experienced nocturnal hypoglycemia. Conversely, all participants during 80% were protected from nocturnal hypoglycemia, and remained protected for 24 h postexercise. All metabolic parameters were similar. Conclusions Reducing basal insulin dose with reduced prandial bolus insulin and LGI carbohydrate feeding provides protection from hypoglycemia during and for 24 h following evening exercise. This strategy is not associated with hyperglycemia, or adverse metabolic disturbances. Clinical trials number NCT02204839, ClinicalTrials.gov. Evening-time exercise is a frequent cause of severe hypoglycemia in type 1 diabetes and fear of this deters participation in regular exercise. Recommendations for normalizing glycemia around exercise consist of prandial adjustments to bolus insulin therapy and food composition, but this carries only short-lasting protection from hypoglycemia. 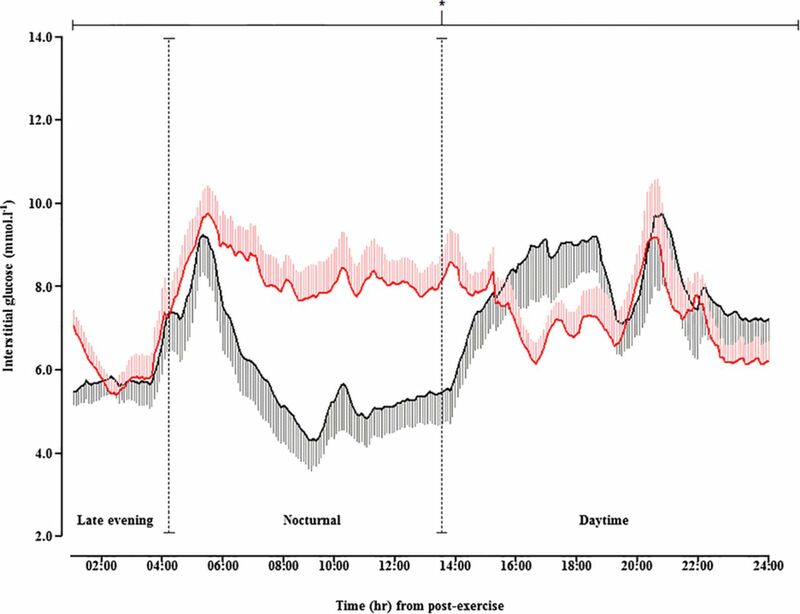 We show that by reducing basal insulin dose in combination with reduced prandial bolus insulin and low glycemic index carbohydrate feeding, exercise-induced hypoglycemia can be avoided for 24 h following evening exercise. Moreover, this strategy is not associated with hyperglycemia, or adverse metabolic disturbances. The American Diabetes Association advocates regular exercise in type 1 diabetes,1 as this is associated with an improvement in a wide range of health outcomes.2 In reality, however, incorporation of exercise into everyday life is significantly hampered by the risk of exercise-induced hypoglycemia.3 Fear of hypoglycemia, particularly during the night, is a major barrier to participation in regular exercise4 as the risk of hypoglycemia is magnified when exercise is performed in the evening, as falling blood glucose is likely to occur while sleeping.5–7 Indeed, a large proportion of patients with type 1 diabetes report a lack of practical advice for preventing hypoglycemia after exercise, and many feel largely uninformed about insulin administration and carbohydrate intake around exercise.4 Moreover, considering the complexity in normalizing glycemia acutely after exercise, many patients are concerned about losing control of wider diabetes management and long-term glycemic control when exercise is performed regularly. Clearly, it is imperative that individuals can effectively manage glycemia following exercise in order to benefit from adherence to regular exercise. Within the literature, alterations to the basal component of an insulin regimen have been predominantly trialed in individuals treated with continuous subcutaneous insulin infusion (CSII) therapy.13–16 When infusion rate is reduced or suspended for exercise, the risk of developing hypoglycemia can be reduced by up to two-thirds.16 However, a large proportion of patients are treated using a basal-bolus regimen with multiple daily injections (MDIs). This is a far less flexible method of insulin delivery than CSII, meaning even small changes in dose may have significant and long-lasting effects. Moreover, there is even less information for performing exercise in the evening, especially when insulin replacement is provided using MDIs. While reducing basal insulin dose could potentially prevent hypoglycemia in the hours following exercise, it is possible that heavily reducing pre-exercise and post-exercise rapid-acting insulin dose may induce periods of sustained hyperglycemia, promoting inflammation and causing other hormonal and metabolic disturbances. This study aimed to examine the effects of reducing basal insulin dose, when employing acute prandial adjustments to rapid-acting insulin and carbohydrate feeding, on early, late-nocturnal, and next day glycemia, after evening exercise in type 1 diabetes. In addition, we aimed to assess the impact of such a strategy on the metabolic, inflammatory, and counter-regulatory hormonal responses. Eligibility criteria included age 18–35 years, diabetes duration >2 years, and glycated hemoglobin (HbA1c) <8.0% (64 mmol/mol). In addition, participation required absence of all diabetes-related complications including impaired awareness of hypoglycemia (assessed via the Clarke method17), no medication other than insulin, and participation in regular exercise (a minimum of 30 min aerobic exercise at least three times per week). Ten males with type 1 diabetes were recruited ((mean±SEM) age 27±2 years, body mass index 25±0.8 kg/m2, diabetes duration 12±2 years, HbA1c 6.9±0.2% (52.4±2.2 mmol/mol), VO2peak 51.3±2.1 mL/kg/min), all of whom successfully completed the study. All were using a basal-bolus regimen comprising glargine (n=8) or detemir (n=2) long-acting insulin, and rapid-acting insulin aspart. Participants had been stable on their respective insulin regimen for a minimum of 1 year. Fifty percent of participants using insulin glargine administered this in the morning, and 50% in the evening. Both participants using insulin detemir administered this twice daily (morning and evening). All were familiar with carbohydrate counting, administering 1.0±0.2 units (IU) of insulin aspart per 10 g of carbohydrate. Fully informed written consent was obtained from all participants following study approval by the local National Health Service Research Ethics Committee (13/NE/0016; NCT02204839). Participants attended the Newcastle National Institute for Health Research Clinical Research Facility exercise laboratory for a preliminary screening visit as described previously in detail,8 before returning to establish peak cardiorespiratory parameters during the completion of an incremental-maximal treadmill running protocol as per the methods of Campbell et al.7 ,8 Following these two preliminary visits, participants performed two experimental trials in a randomized and counterbalanced fashion, which were separated by 7 days (see online supplementary 1 for a schematic of the experimental design). Participants were fitted with a continuous glucose monitor (CGM; Paradigm Veo, Medtronic Diabetes, Northridge, California, USA) a minimum of 48 h before each experimental arm. An Enlite sensor (Medtronic MiniMed, Northridge, California, USA) was inserted into the posterolateral abdominal region to minimize physiological time lags between blood and interstitial glucose,18 with the site of insertion replicated on each visit. Although the Paradigm Veo provides real-time glucose profiles as part of an insulin pump facility, participants did not use CSII and continued their usual basal-bolus insulin regimen. The CGM was installed with glucose alerts that were set at ≤3.5 and ≥16.0 mmol/L during the pretrial period, but the high glucose alert was discontinued after experimental trials. During CGM wear, participants provided a minimum of four daily capillary blood glucose test readings (GlucoMen LX, Menarini, Diagnostics, Berkshire, UK) that were entered into the CGM for calibration purposes. Capillary glucose values, not real-time CGM data, were used for self-informed rapid-acting insulin administration. Participants were required to replicate their diet (assessed using weighed dietary recording sheets) and instructed to maintain their normal insulin regimen, with basal dose standardized (dose, injection site, and time of injection) for 24 h before each experimental trial day. The start of the experimental trial day was considered as the morning sample prior to evening attendance. Throughout this time, participants were provided with a pedometer (Omron Healthcare Europe BV, Hoofdorp, the Netherlands) to record total step count. Participants were instructed to maintain similar patterns of activity across trials avoiding strenuous activity in the preceding 48 h.
The intervention consisted of either maintaining regular basal insulin dose (100%; 34±4 IU), or reducing the total amount of basal insulin dose administered across this day to 80% (ie, a 20% reduction; 27±3 IU). Basal dose timings were maintained throughout as per each participant's individual regimen. On the day after exercise, participants under the 80% condition returned to their usual full basal insulin dose. Participants presented to the laboratory on the morning of each main trial at ∼08:00 h for a resting, fasted venous blood sample via venepuncture. This blood sample defined the start of each experimental arm. Participants then consumed a standardized cereal-based breakfast meal (sugar-coated corn flakes, peaches, and semiskimmed milk; 534±27 kcal), before being discharged from the laboratory. At ∼13:00 h participants consumed a standardized pasta-based lunch meal (pasta, tomato-based sauce, cheddar cheese, olive oil 951±40 kcal) which was prescribed to them by the research team, before returning for the evening visit at ∼17:00 h. Each meal equated to 1.3 g carbohydrate/kg body mass, so that when combined with meals provided in the laboratory, total carbohydrate intake across the day was calculated to constitute ∼5.0 g carbohydrate/kg body mass.19 The combined macronutrient content of all meals equated to carbohydrate=77%, fat=12%, and protein=11%. Patients administered their usual (full/unchanged) rapid-acting insulin dose with both pretrial meals. Between morning and evening visits, CGM continued to capture interstitial glucose under free-living conditions. Participants arrived for the evening laboratory visit at ∼17:00 h. Individual trial start time was replicated across conditions. On arrival at the laboratory, participants assumed a seated and rested position while a 20-gauge cannula (Vasofix, B. Braun, Melsungen AG, Melsungen, Germany) was inserted into the antecubital vein of their non-dominant arm. Following a resting blood sample, participants self-administered a 25% (2.0±0.5 IU) dose (ie, a 75% reduction9) of rapid-acting insulin into the abdomen. Injection site was standardized across trials by administration at mid-point between the iliac crest and naval.7 ,8 ,20 ,21 With this insulin dose, participants consumed a pre-exercise carbohydrate bolus (sugar-coated corn flakes, peaches, semiskimmed milk; 415±17 kcal) equating to 1.0 g carbohydrate/kg body mass. Following this bolus, participants remained rested for 60 min, at which point a second blood sample was drawn immediately before starting 45 min of treadmill (Woodway, Weil am Rhein, Germany) running at a speed calculated to elicit 70% of VO2peak. This exercise intensity falls within current recommendations of the American College of Sports Medicine.22 Breath-by-breath respiratory parameters (MetaLyzer 3B, Cortex, Leipzig, Germany) and heart rate (S810, Polar, Kempele, Finland) were continuously recorded during exercise. Immediately following exercise, a blood sample was taken, with subsequent samples at 15, 30, and 60 min postexercise. In between all blood draws, a stylet (Vasofix Stylet, B. Braun Melsungen AG, Melsungen, Germany) and periodic infusion of saline was used to keep the cannula patent. At 60 min postexercise, participants self-administered a rapid-acting insulin dose reduced by 50% (4.0±0.3 IU) into the contralateral abdominal site to the previously administered pre-exercise rapid-acting insulin injection.8 With this, participants consumed a carbohydrate-based postexercise meal (basmati rice, tomato-based sauce, turkey breast, and an isomaltulose orange flavored drink (10% solution); 402±31 kcal) designed to elicit a low GI (GI=37) response, providing 1.0 g carbohydrate/kg body mass, as per Campbell et al.7 Following this meal, participants were discharged, receiving transport home. CGM continued to capture overnight interstitial glucose under free-living conditions between evening and morning visits. At approximately 180 min following the postexercise meal (240 min postexercise), participants consumed a low GI (GI=38) bedtime snack (Soya and linseed burgen sliced bread, and an isomaltulose orange flavored drink (10% solution); 204±9 kcal), equating to ∼0.4 g carbohydrate/kg body mass, and omitting rapid-acting insulin.7 Participants were contacted before the bedtime snack to ensure compliance. Participants were required to replicate sleeping patterns as much as possible across trials. On the subsequent morning (∼08:00 h), following each main trial, participants returned to the laboratory for a fasting blood sample and were given a standardized breakfast meal (sugar-coated corn flakes, peaches, semiskimmed milk; 415±17 kcal) administering their usual (full/unchanged) rapid-acting insulin dose (8.0±1.0 IU). Following consumption of this meal, participants were discharged from the laboratory with monitoring of interstitial glucose via CGM for a further 11 h (ie, 24 h from exercise cessation). During this time, participants continued to self-record their diet using the weighed food diaries. Basal dose over the course of this day was maintained at 100% according to each participant's usual regimen. At each time point, 10 mL of venous whole blood was taken, with 20 µL used for the immediate quantification of blood glucose and lactate (Biosen C-Line, EKF Diagnostic GmbH, London, UK), and 10 µL for hemoglobin and hematocrit (HemoControl, EKF Diagnostic, GmbH) which was used to correct for changes in plasma volume23 before and during exercise. The remaining sample was dispensed equally into serum separation and lithium-heparin (Vacuette, Greiner Bio-One GmbH, Kremsmünster, Austria) tubes before being centrifuged for 15 min at 3000 rpm at 4°C and stored at −80°C for retrospective analysis of serum insulin (Invitron Insulin Assay, Invitron, Monmouth, UK), cortisol (Cortisol Parameter Assay Kit, R&D systems, Roche Diagnostics, West Sussex, UK), non-esterified fatty acids (RANBUT, Randox Laboratories, London, UK), β-hydroxybutyrate (RANBUT, Randox Laboratories, London, UK), and plasma glucagon (Glucagon EIA, Sigma-Aldrich, St. Louis, Missouri, USA), epinephrine (CAT ELISA, Eagle Biosciences, London, UK), interleukin 6 (IL-6; Human IL-6 Quantikine ELISA, R&D Systems, Roche Diagnostics, West Sussex, UK), and tumor necrosis factor α (TNF-α; Human TNF-α Quantikine ELISA, R&D Systems, Roche Diagnostics, West Sussex, UK). The intra-assay coefficient of variation was <10% for all assays. Owing to assay cross-reactivity with insulin detemir, only participants treated with insulin glargine were included in serum insulin analysis (n=8). Statistical analysis was performed using PASW Statistics V.18 software (IBM, Armonk, New York, USA) with significance set at p≤0.05. Interactions of time and condition were examined using repeated measures analysis of variance. Where significant p values were identified for interaction effects (time×condition), basal insulin dose was deemed to have influenced the response, and simple main effects analyses were performed. Significant main effects of time were further investigated using Bonferroni adjusted pairwise comparisons. Where relevant, paired samples t tests were conducted. Data are presented as mean±SEM. Glycemic control was similar during the 24 h prior to each initial morning visit (CGM mean interstitial glucose: 100% 8.1±0.3, 80% 8.2±0.4 mmol/L; p=0.962; and total interstitial glucose area under the curve: 100% 11 593±547, 80% 12 024±949 mmol/L/min; p=0.876). During this time, no differences were observed in total energy consumed (100% 2333±167, 80% 2357±191 kcal; p=0.982), with contribution from carbohydrate (100% 53±3, 80% 53±3%; p=0.998), fat (p=0.998), and protein (p=0.991) similar. In addition, total rapid-acting insulin units administered (100% 30±3, 80% 30±3 IU; p=0.922) as well as levels of activity (100% 5721±96, 80% 5703±101 steps; p=0.901) were comparable. On the morning of the trial, resting, fasted blood glucose concentrations (figure 1), and fasting serum insulin were similar between conditions (table 1). In addition, there were no differences in counter-regulatory hormone, metabolite (table 1), or inflammatory cytokines (figure 2). Time-course changes in morning time fasted and daytime blood glucose concentrations. Data presented as mean±SEM. Diamonds=100%, circles=80%. *Indicates a significant difference in blood glucose between 100% and 80% (p≤0.05). Morning 1, baseline morning. (A–C) Time-course changes in morning time fasted, and daytime (A) IL-6, (B) TNF-α, and (C) β-hydroxybutyrate concentrations. Data presented as mean±SEM. Diamonds=100%, circles=80%. *Indicates a significant difference in blood glucose between 100% and 80% (p≤0.05). Morning 1, baseline morning visit; Morning 2, next day morning visit; IL-6, interleukin 6; TNF-α, tumor necrosis factor α. On arrival to the laboratory in the evening, participants displayed similar serum insulin (table 1) and blood glucose concentrations (figure 1). There were no differences in any other metabolic markers (table 1 and figure 2). 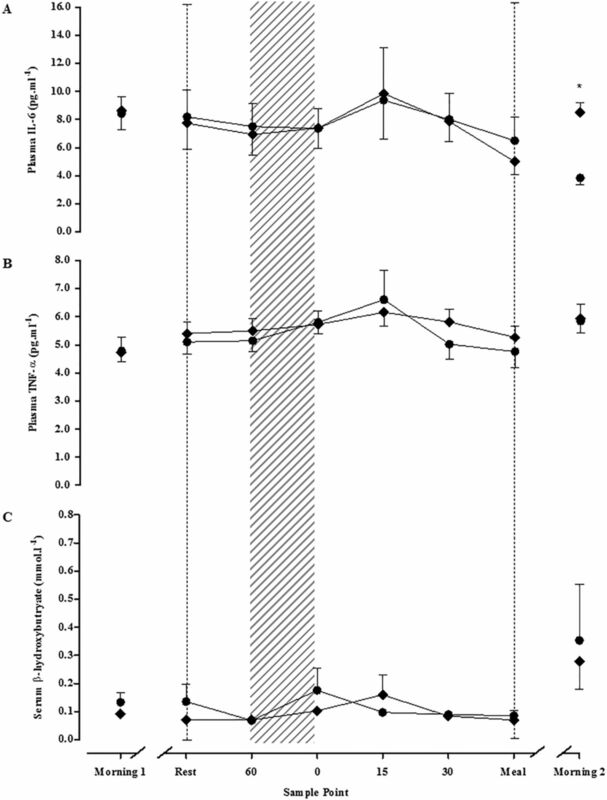 Blood glucose increased similarly following the pre-exercise meal and reduced rapid-acting insulin dose, such that concentrations immediately before exercise were similar (p=0.772; figure 1). Participants ran at an average speed of 9.7±0.4 km/h, completing 7.3±0.3 km and expending 738±48 kcal. Participants exercised at a similar intensity across trials (100% 74±0.1, 80% 73±0.1% VO2peak; p=0.993; 100% 78±1, 80% 78±2% HRpeak; p=0.991) inducing comparable falls in blood glucose (100% Δ−6.4±0.4, 80% Δ−5.9±0.6 mmol/L; p=0.688; figure 1). Blood glucose remained within euglycemic ranges up to the administration of the postexercise meal (p=0.180; figure 1). There were no episodes of hypoglycemia or any requirement for carbohydrate supplementation during exercise or in the 60 min postexercise period under either condition. There were no conditional differences in metabolic parameters up to 60 min postexercise (figure 2 and table 1). The interstitial glucose responses following the evening laboratory visit are presented in figure 3. There was a significant condition×time interaction (p=0.002), and a significant time effect (p<0.001) for interstitial glucose concentrations over the course of the postexercise period. Following discharge from the laboratory, glycemia remained similar between conditions throughout the late evening (1–5 h postexercise; 19:30–00:30 h; figure 3) with interstitial glucose typically in euglycemic ranges prior to the consumption of the bedtime snack (figure 3). Furthermore, interstitial glucose concentrations were comparable immediately before sleep (figure 3), and all participants under both conditions were protected from hypoglycemia during this time. Time-course changes in interstitial glucose concentrations throughout the postlaboratory period. Data presented as mean±SEM. Black trace=100%, red trace=80%. *Indicates a significant difference in interstitial glucose area under the curve between 100% and 80% (p≤0.05). Vertical dashed line break indicates late-evening, nocturnal or daytime periods. With 100%, glycemia fell at ∼6 h postexercise (01:30 h) with the first hypoglycemic episode occurring at ∼8 h postexercise, during the night. The interstitial glucose nadir (100% 2.6±0.2 mmol/L) occurred at ∼8–12 h postexercise (02:45–06:45 h) and during the hours of sleep (figure 3). Conversely, glycemia was preserved throughout the night under 80% (figure 3). All participants under 80% were protected from nocturnal hypoglycemia, whereas nine participants (90%) experienced nocturnal hypoglycemia under 100% with three of those participants encountering two or more nocturnal hypoglycemic episodes. Moreover, total time spent in hypoglycemic ranges was significantly less under 80% (p<0.001), with more time spent euglycemic (80% 397±56, 100% 122±28 min; p<0.001). 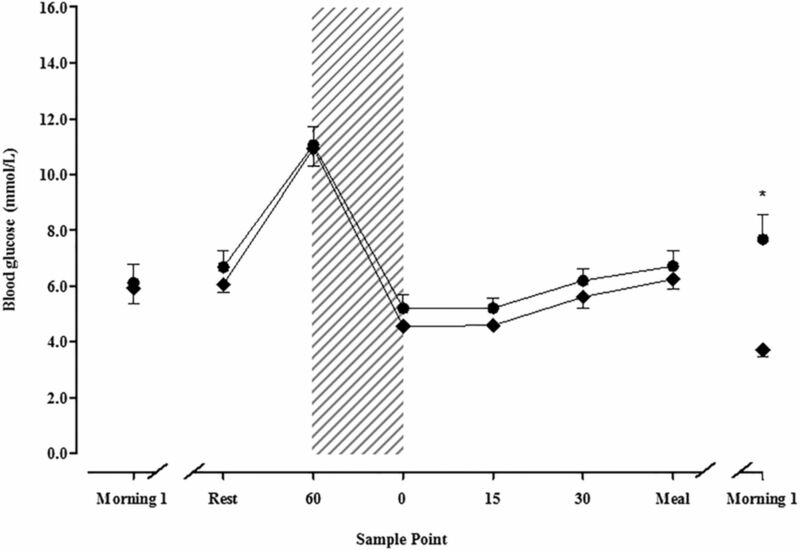 Immediately on awakening (∼13 h postexercise; 07:30 h; figure 3), interstitial glucose was significantly less under 100% with participants typically in the hypoglycemic range (100% 3.3±0.6, 80% 8.1±0.6 mmol/L; p=0.008; figure 2). Fasted, resting venous blood glucose was significantly lower under 100% (100% 3.7±0.3, 80% 7.7±0.9 mmol/L; p<0.001; figure 1), and significantly less than concentrations measured on the morning before exercise (p<0.001). In comparison, participants under 80% were typically in the euglycemic range on awakening, and displayed similar blood glucose concentrations to the morning before exercise (p>0.05). There were no differences is serum insulin at this time (table 1), with concentrations similar to those elicited on the morning before exercise (p>0.05). There were no conditional differences in the temporal changes of counter-regulatory hormones or metabolites during this time (table 1 and figure 2). In addition, TNF-α was unchanged in both conditions. IL-6 was significantly lower under 100% (figure 2), with concentrations under 80% remaining similar to both pretrial morning and trial resting samples (figure 2). Over the course of the postexercise day, participants under 100% spent more time hypoglycemic (interstitial glucose <3.9 mmol/L: 100% 264±22 vs 80% 5±6 min; p<0.001) and hyperglycemic (interstitial glucose >8.0 mmol/L: 100% 123±21 vs 80% 67±16 min; p=0.004) ranges, with less time in euglycemia (interstitial glucose 3.9–8.0 mmol/L: 100% 643±54 vs 80% 1048±71 min; p=0.007) than those under the 80% condition. During this time, total energy consumed was significantly greater under 100% (100% 1143±48, 80% 714±48 kcal; p<0.001), with increased contribution from carbohydrate (100% 76±3, 80% 69±3%; p=0.004). Levels of activity were similar between conditions with total number of steps comparable (100% 4231±102, 80% 4301±132 steps; p=0.602). This study demonstrates that combining a reduced basal-bolus insulin dose, along with low GI carbohydrate feeding, provides full protection from exercise-induced hypoglycemia for a total of 24 h after exercise. Notably, when basal insulin dose was reduced by 20%, there was a clear normalization of glycemia during the night, protecting all participants from nocturnal hypoglycemia with concomitant hyperglycemia. In addition, we show that adopting this strategy does not induce other metabolic disturbances. To our knowledge, we have, for the first time, demonstrated that it is possible to completely avoid acute and late-nocturnal hypoglycemia in type 1 diabetes, despite performing a prolonged bout of moderate-to-vigorous intensity running (expending ∼740 kcal and running 7.3 km) exercise in the evening. In addition, we show that while protecting patients from hypoglycemia, it is also possible to reduce exposure to hyperglycemia. Typically, preventing hypoglycemia after exercise occurs as a consequence of inducing hyperglycemia;8 ,9 ,20 ,21 ,25 avoidance of this is critical for long-term diabetes management, especially if exercise is to be performed regularly and consistently. We required our participants to reduce the total amount of basal insulin by 20% (∼7 IU), in addition to reducing pre-exercise and post-exercise prandially administered rapid-acting insulin dose, and consuming low GI carbohydrates after exercise, to achieve this. As this is a strategy that can be readily communicated to patients, these data have considerable clinical relevance. Effectively managing the risk of hypoglycemia and normalizing glycemia following exercise is critical for safe long-term exercise adherence, and potentially improvements in wider diabetes management. Differences in glycemia did not become apparent until ∼6 h postexercise, suggesting that reducing total basal insulin dose does not alter acute postprandial glucose handling or acute glycemic control following exercise. Beyond ∼6 h postexercise, interstitial glucose concentrations began to fall under the non-reduced basal insulin condition with the first episode of hypoglycemia occurring at ∼8 h postexercise (∼02:00 h). Further falls in glycemia were evident during the night, such that 90% of patients experienced nocturnal hypoglycemia when basal dose was not reduced. This is in keeping with our previous findings7 ,8 and those of others,10 and highlights that falls in glycemia during the night cannot be prevented when employing prandial adjustments only. Conversely, when a basal reduction is employed in combination with acute prandial adjustments, glycemic control is maintained throughout the evening and night, protecting all patients from hypoglycemia. With our relatively small sample size, it was not possible to compare insulin types and timing of administration. However, further research is planned to investigate this aim. It is also important to consider method of insulin delivery also. The participants in this study were treated on a basal-bolus regimen, and therefore study findings may differ in patients treated with CSII therapy. Despite this, our findings are likely to carry practical implications which could be of use to patients across treatment regimens. Importantly, our patients were well-controlled and physically active males performing a single bout of continuous aerobic exercise; outcomes pertaining to acute and late-onset hypoglycemia may differ in less well-controlled, less active patients, females, and following different forms of exercise. Indeed, recent data suggest that not all patients choose to consume a bedtime snack, and that this should not necessarily be recommended systematically, but prescribed in an individualized manner.27 We suggest that patients tailor these strategies to their individual self-monitoring plans and exercise habits. Indeed, because of the complexity of type 1 diabetes and postexercise glucose regulation, a degree of individual trial and error will remain. Nevertheless, this should not detract from the clinical importance of these findings. Exercise participation rates for patients with type 1 diabetes are significantly lower than their age-matched and gender-matched non-diabetic counterparts,28 and helping patients better manage their blood glucose control after exercise could encourage those fearing exercise-induced hypoglycemia to engage in regular physical activity. In summary, this is the first study to demonstrate that exercise-induced hypoglycemia can be avoided, without exposure to hyperglycemia, when people with type 1 diabetes employ a combined basal-bolus insulin reduction and low GI carbohydrate feeding strategy. This strategy does not significantly augment ketonemia or cause other metabolic disturbances. The authors thank the study participants for their time, effort, and commitment, as well as the research team at the National Institute for Health Research Clinical Research Facility, Newcastle-upon-Tyne, for their assistance. American Diabetes Association. Diagnosis and classification of diabetes mellitus. Diabetes Care 2011;27:S5–S10.
. Simulated games activity vs continuous running exercise: a novel comparison of the glycemic and metabolic responses in T1DM patients. Scand J Med Sci Sports 2015;25:216–22.
. Type 1 diabetes. Springer, 2012. Medicine ACoS. ACSM's guidelines for exercise testing and prescription. Lippincott Williams & Wilkins, 2013.
. Calculation of percentage changes in volumes of blood, plasma, and red cells in dehydration. J Appl Physiol 1974;37:247–8.
. The use of the glycemic index in predicting the blood glucose response to mixed meals. Am J Clin Nutr 1986;43:167–72. Contributors MDC and DJW contributed to the study concept and design, researched data, and wrote the manuscript. MW and JAS contributed to participant recruitment and reviewed and edited the manuscript. JTG aided in data collection and data analysis. EJS contributed to the study concept and design, provided materials and reviewed and edited the manuscript. RMB and DT analyzed data and reviewed the manuscript. DJW is the guarantor of this work and, as such, had full access to all of the data in the study and takes responsibility for the integrity of the data and accuracy of data analysis. Funding This study was funded by the Northumbria University Strategic Investment Fund. Ethics approval NHS Research Ethics.